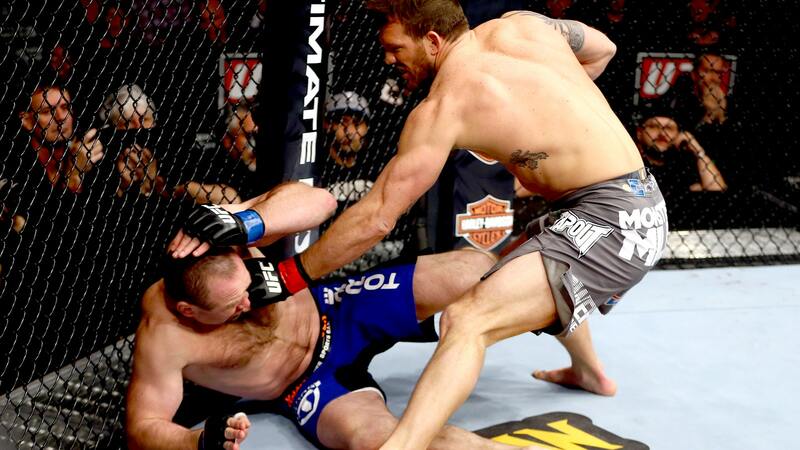 Ryan Bader is back in action and is taking some tough lessons learned into the Octagon. Ryan Bader isn’t crazy enough to say that he’s happy he’s been knocked out, but it’s an experience that’s actually bettered him as a fighter. It’s a widely regarded fact that when a fighter gets knocked out for the first time, especially if they’ve gone most of their careers avoiding that event from happening, it can bring about a profound change in how they approach a fight in the future. It has nothing to do with scientific side of brain trauma in terms of how easy or hard it is to be knocked out. It’s the psychological damage that a fighter endures when they are separated from consciousness for the first time. A great many fighters can never get over that moment, and the way they once fought and the way they will fight can sometimes be classified as BKO and AKO â before knockout and after knockout. Ryan Bader made it 16 fights into his pro career without ever being knocked out, and his mind played tricks on him with the paranoia of what it was going to feel like when he finally got laid out from a punch or a kick. Most fighters won’t admit something like that with brutal honestly, but Bader is open when saying there was a fear creeping in the back of his mind of what it would feel like to actually be knocked out. "Some fighters, like my (Lyoto) Machida fight, some fighters get knocked out and they might be a little gun shy coming back or whatever. For me, I had never been knocked out before or unconscious as far as any submissions or anything in training or anything before that. There’s always that in the back of your mind like what it’s like. So that happened and I was like that’s not bad at all," Bader told FOX Sports. "So it kind of opened it up for me and I came out aggressive the next fight. I’m still going to fight aggressively and do what I do. That said, that fear that was once there in the beginning of my career isn’t there any more. I think that makes me a more dangerous fighter." Growing up as a wrestler before moving into MMA, Bader had never even really been punched in the face so he’s had a lot of trial by fires since starting his new career back in 2007 after graduating from Arizona State. Getting knocked out isn’t fun and there’s no celebration that happens when you wake up, but Bader believes the experience as a whole was just another tool that he can use as he tries to get better and become a top fighter in the light heavyweight division. "Coming from wrestling, there’s physical contact but we’re not getting punched in the face. At first you’re like what’s it going to feel like to get punched in the face? Once it happens it’s like it’s not that bad. Then the next one is what’s it like to be knocked out? And that happened to me and I was like I woke up, I wasn’t hurt, my pride was hurt and I was embarrassed but there’s no fear there anymore," Bader said. "The fear is gone with that so you go out there and you donât change anything. You use what got you there." Pundits will quickly point at Bader’s last trip to the Octagon against Glover Teixeira as proof that not living in fear of a knockout and a devil may care attitude is what cost him the fight. Bader had Teixeira hurt and staggering early in the first round, but after a wild exchange ensued it was the former NCAA All-American who was laid out on the canvas, knocked out from punches. Bader is quick to shoot the theory down, however, because it wasn’t some game of chicken where he was daring Teixeira to punch him just to see if he could take the shot. In reality, Bader’s mistake was one of over excitement when he knew he had Teixeira hurt and that’s what cost him the fight. "I was being patient throughout the whole fight throwing technical punches, then at the end I got wild and threw two uppercuts in a row and that’s not what we worked on and I paid for it," Bader said. "I thought I was doing something different in my head during the fight, but I wasn’t. If one of those punches landed and knocked him out, then people wouldn’t be saying anything about it. It was hard to take because I was that close." Unfortunately in MMA, coming close still ends with a loss on your record and Bader understands how that works. So as he approaches his next fight this weekend in Australia, Bader is ready to introduce Anthony Perosh to the knockout just to see how he likes it. "I feel like I hit pretty hard and I’ve been working a ton on my boxing," Bader said. "I’m taking this fight very seriously and I do think I can knock him out."